So here's the deal. I've already lamented the fact that I won't be able to stuff our dog, Cooper in the carry-ons we're taking to Europe. But if we're being honest, my biggest concern wasn't what to pack, but what to pack in. The correct luggage can make or break a trip (especially when you're covering 4 countries in 3 weeks). The last thing I want to do is force Patrick to lug my bag around because it's too heavy or too uncomfortable (which I did on our trip to New York). After reading a TON of reviews and accepting suggestions from our friends, we pulled together three different options to check out. All three are carry-on size. All three have wheels and a backpack option. 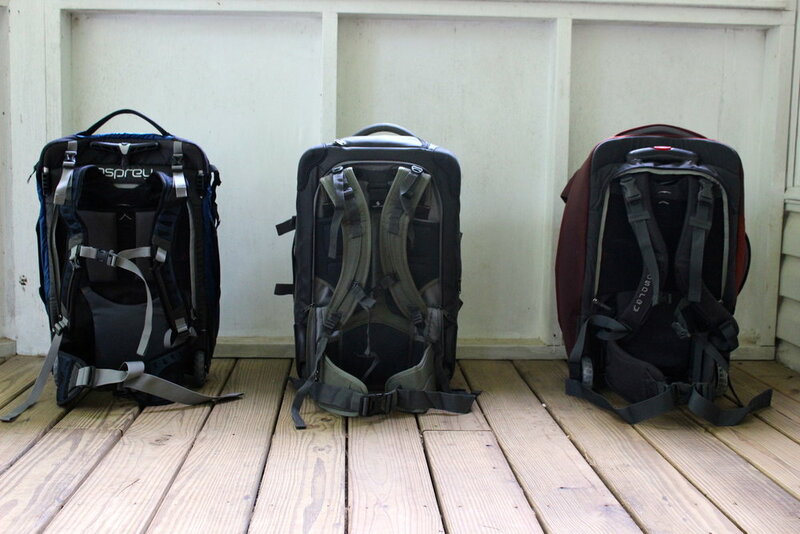 All three come with an attached day-pack and room for a laptop. So how do you choose?! For the greater good of all travelers, I inspected all three, packed all three, carried all three, then made my decision. What you will love:If you're looking for the perfect marriage between a suitcase and a backpack, this is it—the Meridian is sturdy, but not too bulky. 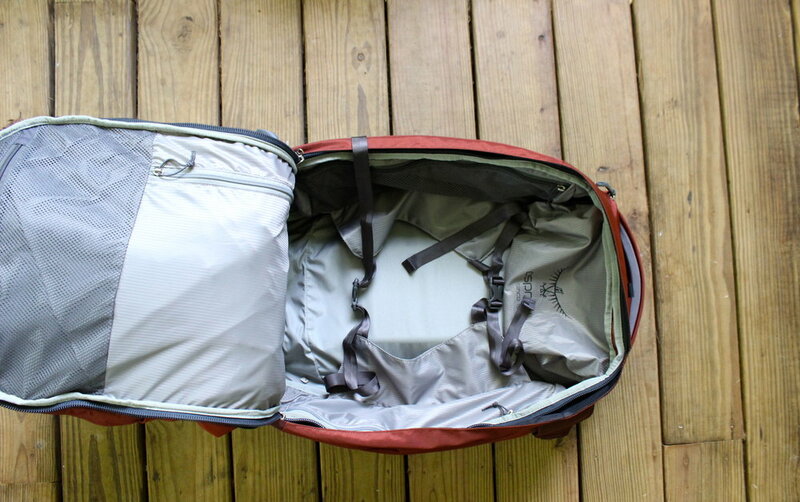 The side panels of the bag are strong, so they stand up when you're packing, like in a suitcase. The top-carrying handle is cushioned too, making it easy to carry up stairs if you're not wearing the backpack. Also, you'll love the fact that the hip-belt is incredibly soft and cushiony. 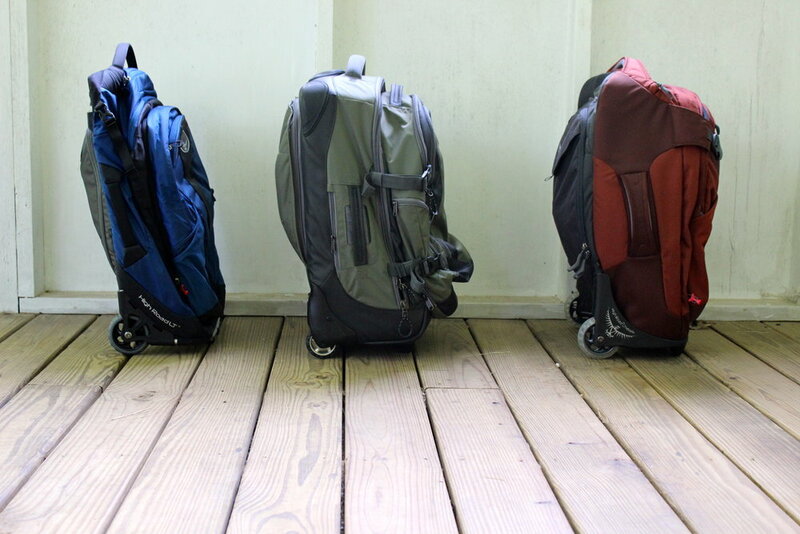 What you will hate: There's not a great place in the day pack to keep important documents (read: passport). Also, the bag is a little on the heavy side (7 pounds). Overall: This bag offers the most volume for the least amount of bulk. And it doesn't look as "techy" as lots of other convertible packs. What you're getting: A 25-inch, 58L convertible pack with an easy-to latch back-pack component, durable material, a rectangular extendable bar, plenty of hidden zippers for conscientious travelers, and a large attached day pack. Use this zipper to access the interior of the suitcase, on the go. 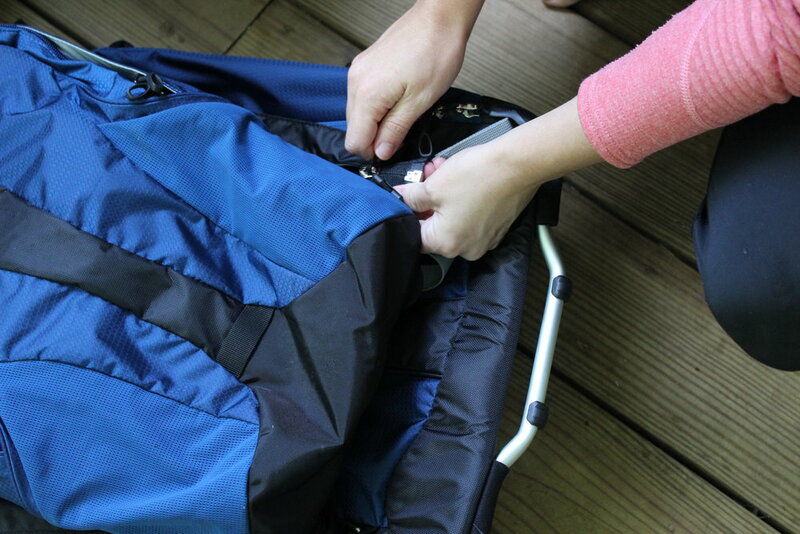 What you will love: When you unzip the carrying backpack component, it attaches using velcro which is incredibly easy. Also, the day-pack includes a hidden zipper for important documents and money that can't get stolen. And don't forget, there's an zipper that lets you access the interior of the suitcase without having to open the entire thing—great when you're on the train and need a pair of socks, but don't want to unpack in front of everyone. What you will hate: My sweet friend Emily Fenske offered to let me check out her bag (pictured here), and she said that on their last trip, if she wore the whole thing, she felt like a turtle. Boo! Unfortunately, this bag loses when it comes to size. It weighs 8 pounds! Also, with the day pack attached, it's hard to open the main compartment of the bag. Emily said she usually wore the day-pack on her chest while wearing the larger pack on her back, so it wouldn't feel too bulky. Overall: The Eagle Creek Switchback has the most thoughtful storage (i.e., access to the interior and hidden compartments), but the bulk detracts greatly. It was the largest of the three in terms of size—weighing in at a hefty 8 pounds. What you're getting: Osprey's newest 22-inch, 50L bag, with an extendable T-bar handle for rolling, a back-back component, as well as a detachable small day-pack that includes space for a laptop. Durable but lightweight materials make this bag the lightest by far—just 5.5 pounds. After you unzip the backpack component, all you have to do is snap 4 hooks—two on top, and two on the bottom. What you will hate: This bag offers about 10 L less volume as the other two. And unlike the Eagle Creek, it doesn't have a great hidden compartment for passports. The hip-belt is a little on the thin side, but it's still very comfortable. Overall: This bag is the lightest and thinnest—and the least expensive! Plus, the blue color is perfect for me or Patrick, and it actually feels like a back pack, not a suitcase. After lots of himming and hawing... I made my final decision. Actually it wasn't all that hard. All along, the blue Osprey Convertible Series was the clear favorite. It's thin, it's light, and it's the least expensive! I know the blue color will be great for Patrick and me, and we'll use it for many, many trips to come. In fact, I already used it for one trip, and I was stopped three times at the airport by folks wondering what kind of bag I was carrying. Not too shabby! Now all that's left is the packing! Special thanks to my friends at Outdoor Sports Marketing for providing two Osprey bags for this product review, and to Emily Fenske for offering her Eagle Creek bag for review. All opinions are my own and honest. I promise!